Here come the new notification related to the Government jobs in Bihar state. Bihar Public Service commission which is well known as BPSC is going to recruit Indian candidates for various officer profiles. There are total 1255 vacant positions of Revenue Officers, deputy commissioners and many other job profiles. We personally took this information from the official PDF file which was published on the BPSC official website. We share the reference link below under IMPORTANT LINK section. Below we share the complete detail in this article, read the whole article carefully before applying online. 16). Profile Name: Block SC and ST Welfare officer. What are the eligibility Criteria for Applying this BPSC Recruitment? Education: All Indian graduates can apply for these Govt job in Bihar. Age Bond: Applicants age must be in between 20 years to 40 years for applying these Government jobs in Bihar. For more information related to age criteria for various job profile please read the official pdf file carefully. 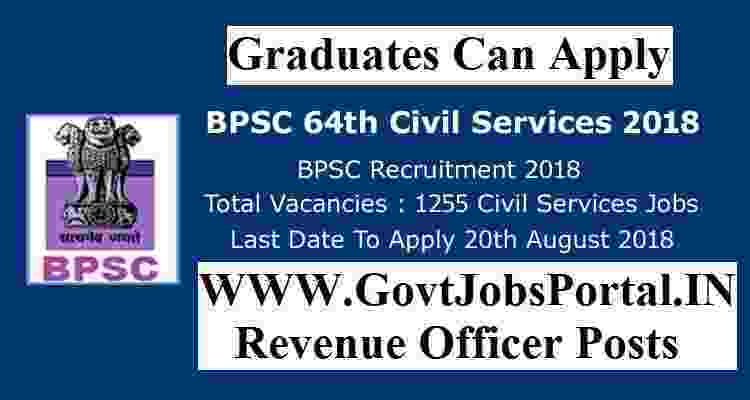 Those who are interested in one of the above job profile can apply online through the BPSC Department official website. There is no other way for applying for this BPSC Recruitment process. We share below direct link for applying online for these Govt jobs in Bihar. Check IMPORTATN LINK section for reference link as well as for the online application form for this recruitment process.